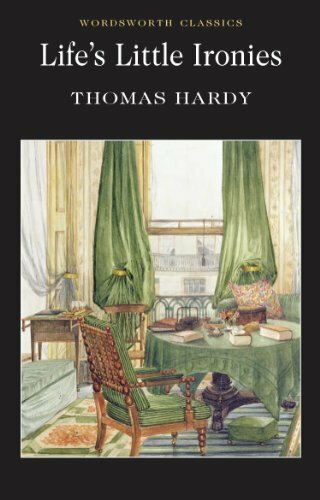 This particular collection of stories from Thomas Hardy which I only read for the first time two years ago at the start of my Thomas Hardy challenge – are very well named. Hardy is a master at delivering a soft little punch to the guts as his story draws to a close. I say soft punch because so often the reader can see it coming – and still Hardy knew how to ring every last little bit of drama and emotion out of his characters. I love Hardy’s world, as many regular readers of this blog will be aware, and I thoroughly enjoyed re-visiting these stories which I had remembered so very well from two years ago. Funnily enough however my favourites then and now are different. Previously I had particularly enjoyed the stories ‘An Imaginative Woman’ and ‘ ‘A tragedy of Two Ambitions’ both of which I still really loved, but this time I particularly appreciated the pathos of the story entitled ‘The Son’s Veto’ about a middle aged woman, partially crippled, who had married outside her station and moved from her beloved home village to a London suburb, now widowed, her growing son, brought up as a gentleman puts the block on any future happiness she could have had when he makes her promise not to marry her former sweetheart, a grocer, who she has unexpectedly met again. “When she had opened the door she found Sam on the step, and he lifted her bodily on his strong arm across the little forecourt into his vehicle. Not a soul was visible or audible in the infinite length of the straight, flat highway, with its ever waiting lamps converging to points in each direction. The air was as country air at this hour, and the stars shone, except to the north-eastward, where there was a whitish light – the dawn. Sam carefully placed her in the seat, and drove on. The volume concludes with ‘A few Crusted Characters’ – apparently originally entitled ‘Wessex Folk’ – it was this section I had remembered least well – they are a wonderful group of sketches – highlighting he passage of time, with oral stories told by a group of people sharing a coach – stories of farce, tragedy and rural traditions, that take the nostalgic reader back to familiar places and family names of Under the Greenwood Tree –(one of my favourite Hardy novels). It happened on Sunday after Christmas the last Sunday they ever played in Longpuddle church gallery, as it turned out, though they didn’t know it then. The players formed a very good band almost as good as the Mellstock parish players that were led by the Dewys; and that’s saying a great deal. There was Nicholas Puddingcome, the leader, with the first fiddle; there was Timothy Thomas, the bass-viol man; John Biles, the tenor fiddler; Dan’l Hornhead, with the serpent; Robert Dowdle, with the clarionet; and Mr. Nicks, with the oboe all sound and powerful musicians, and strong-winded men they that blowed. For that reason they were very much in demand Christmas week for little reels and dancing-parties; for they could turn a jig or a hornpipe out of hand as well as ever they could turn out a psalm, and perhaps better, not to speak irreverent. In short, one half-hour they could be playing a Christmas carol in the squire’s hall to the ladies and gentlemen, and drinking tea and coffee with ’em as modest as saints; and the next, at the Tinker’s Arms, blazing away like wild horses with the “Dashing White Sergeant” to nine couple of dancers and more, and swallowing rum-and-cider hot as flame. These stories about family, social ambition – and its consequences, are deeply ironic. Many of the characters are tragic, the misguided actions of themselves or others impacting upon their fortunes. In these stories we encounter The Great Exhibition of 1851, and the dawn of the railway, we see rural life juxtaposed with a smart London life. Many of the themes that are present in Hardy’s novels are present in these hugely readable stories. So often with Hardy’s shorter fiction the scope of a thirty page story is not dissimilar to that of his novels, years pass, characters age and many of these stories could be stretched out to the length of a novel. I certainly think Hardy was a particularly good short story writer, within the confines of the genre; he manages to create whole communities and families, trace histories over many years, while keeping the narrative flowing brilliantly. Amazingly we have only three books left in the Hardy chellenge; Jude the Obscure, The Well Beloved and A Changed Man and other Tales, and then it will be all over. Where has the time gone? All the novels and most of the short stories I had read before some more than once, but the real joy of this project has been sharing my love of Hardy with others and finding that I love Hardy as much as I always thought I did, mabe even more so. I loved reading about how you enjoy books by Thomas Hardy . I share that sort of enthusiasm for Emile Zola. Curiously, both authors were born in 1840 and I wondered if their paths ever crossed! I read a wonderful comment about both writers: they wanted “…to show the sorriness underlying the grandest things and the grandeur underlying the sorriest things”. I’ve only read 1 book by Hardy ( Return of the Native) and 9 by Zola! I need to read more Hardy! Oh yes do. I have read a few Zola, but some time ago – when I was in my early twenties I don’t remember them that well.Must re-visit them. I might have to borrow that one from you – I’m looking forward to reading it. I’ve loved the Hardy project – people assume I’ve read them all (for some reason) but actually I’d read a few of them many times and many not at all. I’ve really enjoyed becoming reacquainted with friends from way back and enjoying some amazing reads. I’m even looking forward to re-reading Jude in January! yes looking forward to seeing what I think of it now – I’ve only read it once – and it’s one I rember with less fondnedd I think. Well done on doing so well with your challenge! Maybe 2014 will be the year I actually read some Hardy…….! I’ve loved Hardy’s novels, but I don’t recall reading his short stories. I wasn’t sure that they would suit his style, but clearly they did. Well yes I think he was an excellent short story writer.